I turned many eyeballs today. People asked me, why did you pay and register ! Yes as a part of the organising team, I could have dodged that with a backdoor entry to the race and have fun. But that was not the idea. I wanted to see how we are organising things at BBCH and is it worth what we are offering to our riders ! It is often observed that face value precedes over actual fact in many walks of life. So reality check is essential time to time. I just did that. And I'm glad that I did it. The whole perspective of racing is different for me. Frankly speaking, I'm not at all a racing material and on the outset, I don't even look like a cyclist with all those untoned muscles and not so desirable high BFP. But under all of those unwanted layers, there is a reasonably sized heart doing the duty. And who am I to ignore it ! So there I go. Now BBCH is quite sophisticated. How easily one books a movie ticket or groceries or clothes or electronics through any device online, can book a ticket for BBCH races also in a similar way. A new thing is introduced which can give you a tracking option of registered participants online and I guess that will help to get in lot more competitiveness among the riders. Infact many people saw my name in that list and asked very surprisingly whether am I actually racing or not ! O dear yes I will. For the organisers and volunteers, race is not only the riders riding on course, there are 100 things to take care to make the event successful. That requires lot of energy and time which snatches the precious time of cycling for them and to come to a terms with that it requires tremendous amount of mental strength to suppress frustration and make peace with it. So be it. If there is a will, there is a way. I've been out of riding for a long time now for certain reason but since it's an ITT and one can choose a speed to their level of comfort, I happily calculated in my mind that if I can maintain my Randonneuring speed and push little more, I'll surely be able to finish the race within the cut off time. My whole target was to come back to the finish line before the podium starts and nothing more than that. See setting simple target makes life so easy. So me and my colleague Promise Gangani decided to start one after the other and do a chatty ride all through. But I had a little idea about how he will hammer the course on the drop bar for the entire length. After the startline formalities it was time to go and then I realised that I forgot to adjust my handlebar to a more comfortable position. This is why I said that I'm not a race material. One can do this for an endurance ride but not for a race. But again when you are in an organised event, things actually get taken care off. I was wearing a participant's hat ( read helmet ) now leaving behind organiser's socks. Good folks of BOTS had set up a last minute bike maintenance desk and they fixed my issue in no time and made me ready to leave from start line. Khuram and Marghoob flagged off and I was on the road to cover 33 kms in a fastest possible time. Training, understanding, skillset, planning, experience - these are the key things for a race and I had none of them with me. But how does it matter when you are not competing with anyone, not even with yourself. Take it easy was the mantra and I should not get any cramp on the way as I have to come back all on my own. Moderate traffic, lesser noise, lazy landscape around and riders passing by one by one endlessly. I'm out of riding my road bike almost for a year and half now and this was more like getting used to with it again and follow the sound of my legs. And that is what I did throughout. I didn't overtake a single rider who were ahead of me but the vice versa was the norm. At the start line I was chatting with Rushit Davda and he was jovially telling that he will be starting sometime in the middle of the pack and will be able to see the entire lineup when the faster guys will cross from the back. When it was happening with me, I remembered that and it was quite enjoyable as I could see every rider of our event and how good they are. Today BBCH saw a participation of 122 riders where as there were 134 registrations and this number is quite incredible at a domestic level. And I'm not quite aware off whether there is any bigger participation in an ITT anywhere in India apart from this. BBCH has come a long way. Where the seasoned masters riders consider BBCH as a favourite playfield, we as organisers think that it is a great breeding ground for the young riders who are the potential champions of tomorrow. Today that thought was reinforced where half of the participants were in amateur category. 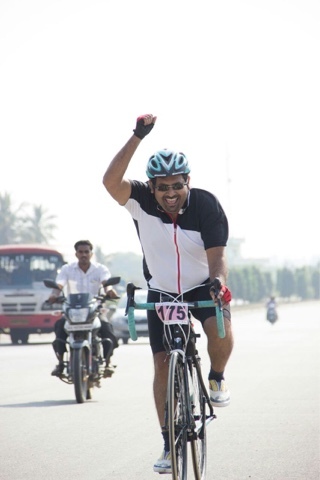 Time will say whether BBCH has contributed enough towards the advancement of the sports of cycling or not but the effort is straight from the honest hearts. After the U-turn the headwind became prominent and slowed down quite a bit. This was the stretch to have an eye on the opposite side of the track to watch out the pro guys coming over and in no time lapping me from behind and vanishing in the horizon. It was so cool to see the glamour around with all the lycra cladded folks on their super kits dazzling the tarmac with utmost grace and strength. It made me proud to think that what culture we are nourishing at BBCH. This race was supported by CrankMeister team and they have done a very nice job on the course by marking it nicely keeping in mind how a rider will approach and read the signs on the road. One such marking which said '3 kms to go', kicked right at the centre of my head and I was delighted to think that I'm almost home. Lets hammer now. Started pushing it hard and a mild sign of right calf muscle cramp showed up and managed somehow to continue further. Last mile was probably the fastest for me at around 30 kmph or so which ended up little avove 22 kmph as an average. I could see the finish line from the other side on top of a saddle for the first time and that made me ecstatic. Couldn't hide my joy and the fist went up to the sky. I finished my race in exactly 90 minutes which was estimated and then it was the celebration time. What energy was lost, gained double of that from candid chats with hundred of folks and touching lives warmly. First time BBCH had put up a big tent at the podium to get some shade from the scorching sun and it made a great difference. It brought everybody under one roof literally. It was indeed festive. BBCH had got nice and healthy breakfast in a slick package which was also great after a hard ride. Podium was good with lot of prizes not only for the winners but for every participants. It was almost a lakh of rupees worth all put together. For a domestic racing platform it is not small by any measure. These are not from a perspective of an organiser but from an eye of a participant. I heard someone saying that BBCH is well organised, super fun and total value for money. That summarises quite a bit. Lets wrap up until the next as a participant as well as a volunteer. Whoever have shown encouragement towards my participation, I'm very grateful to them for their support, love and good wishes. How can I forget to tell that today Bhola accompanied me and enjoyed the ride too. "the effort is straight from the honest hearts"... I couldn't agree more Suman. And what a commitment you guys have. I wish BBCh grows big one day like BCCI and wish to see your names written in stones. And congratulations on your ITT finish!